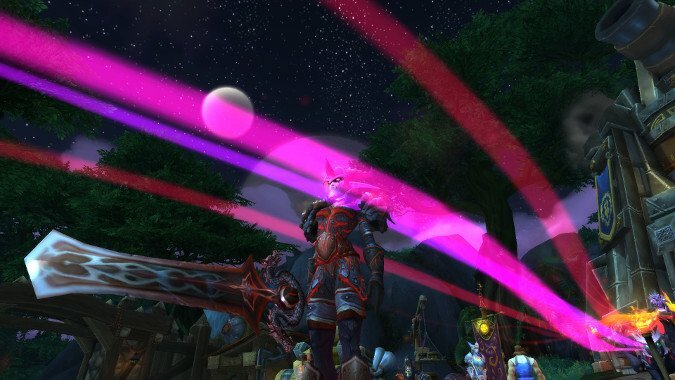 The thing about alpha tests is that news can come at you pretty fast, and that’s especially true when it comes to these datamined broadcast text spoilers that Wowhead has dug up. They definitely reveal more details about exactly what happens at Teldrassil and what role Vol’jin will be playing in Battle for Azeroth despite currently being very dead. As is always the case, the standard disclaimers all apply — this is datamined information from an alpha test and thus subject to change at any moment without notice and it contains heavy spoilers for Battle for Azeroth. So don’t read this, then get upset that it told you things about the upcoming expansion, since that’s literally the only possible outcome if you do read it. If you’re avoiding spoilers, this is not the post for you. 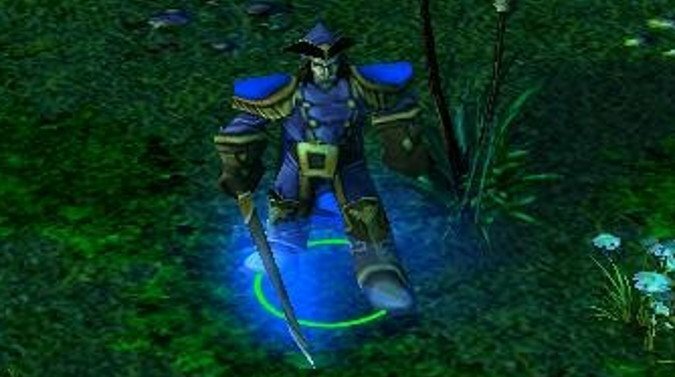 What role does Daelin Proudmoore play? We don’t know what is going on, but there’s some datamined text that seems to come from Daelin Proudmoore. Perhaps he’s a ghost or perhaps this is Jaina thinking about him. At this point it’s impossible to say but it certainly sounds ghostly. It’s accusatory and feels a lot like what Jaina’s guilty conscience might be telling her in Battle for Azeroth. You stood and watched as those animals cut me down. What has your betrayal earned you? You sided with mongrels over your own flesh and blood! The Horde are nothing more than monsters. No surprise they turned on you! They took your father… betrayed your king… and you did nothing! Will you abandon all your allies to the Horde? We know Jaina and her mother will be having difficulties over this incident, so it’s not surprising that it would be revisited in some way. At the time, Jaina was trying to be a peacemaker and bring about a new age of relative calm between the Alliance and the Horde, but following the destruction of Theramore and the death of Varian in Legion she’s taken a much more anti-Horde stance. Now she regrets her actions in stepping aside and allowing the Horde to dispatch her father which she once believed to be necessary. It’ll be interesting to see how this plays out. Apparently the terrifying Goblin beverage Kaja-Cola is making some kind of appearance in Battle, with some datamined broadcast text that shows off the effect of drinking the stuff. Kaja-Cola is made with Kajamite, a mysterious ore that Keeper Mimiron experimented on to give Goblins their enhanced intelligence. However, the ideas that Kajamite gives you fade if you don’t keep taking the stuff, and Kaja-Cola is thus highly sought after. 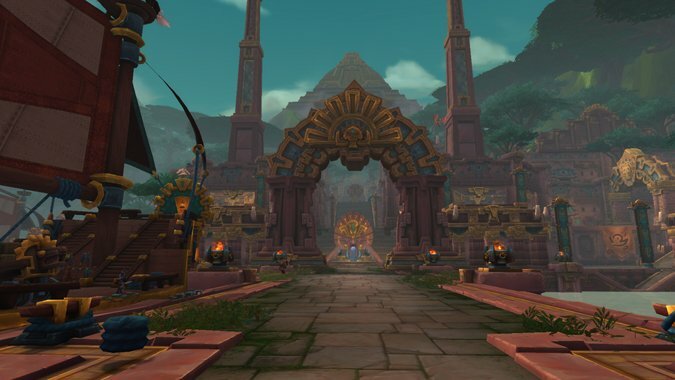 We know that there are Kajamite deposits on Zandalar. 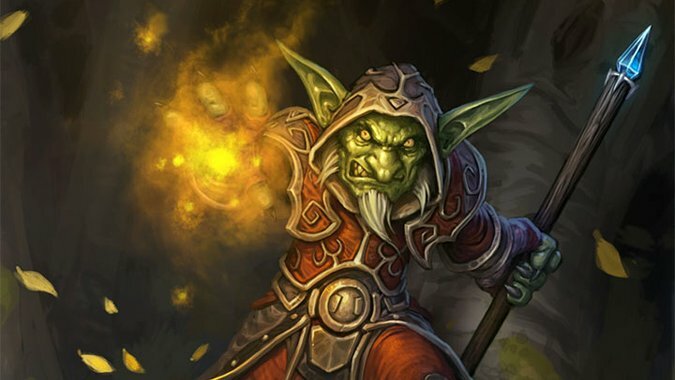 It was the Zandalar Trolls who first enslaved Goblins to serve in Kajamite mines on Kezan, thus creating the current crop of intelligent Goblins who overthrew the Zandalar a mere century before the opening of the Dark Portal. So we may see some Goblin shenanigans to get their hands on the Zandalari Kajamite stashes, since by Goblin law all Kajamite belongs to Goblins. None of the datamined text seems like the Kaja-Cola is giving anyone particularly good ideas, mind you. Cars that drive on water instead of land! Teldrassil charcoal briquettes! Rich smoky barbecue flavor! Azerite magic 8 ball? Azerite, or azerwrong? A pillar, not for supporting the roof, but for holding the floor down! A love story… about a human and, uh, a Jinyu! Still, I’d probably drink some. I’m not at all sure what’s happening here, but it feels like our old buddy Zalazane came after Vol’jin’s ashes and got more than he bargained for. Is Vol’jin one of the Loa now? Is he a ghost? I don’t know, but it definitely seems like he’s something. And Zalazane may finally be dead once and for all, which would be nice. Search, minions. Find the ashes of Vol’jin and bring them to me. Crush da Darkspear and find me those ashes. 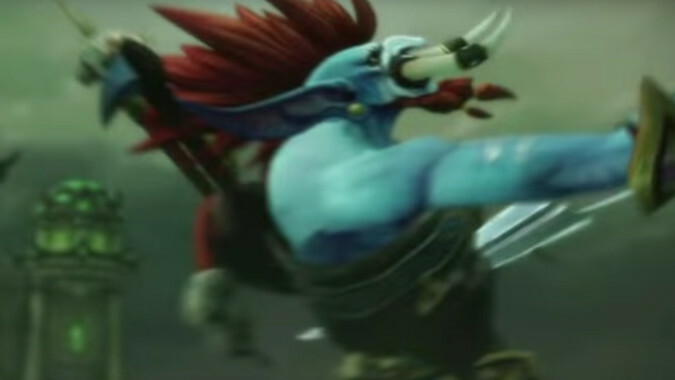 Where are you hiding him, Darkspear? Where is my old friend? Where? Where are you hiding Vol’jin? How are you hiding him? Minions! Slay their champion and bring me da ashes of Vol’jin. NOW! You cannot hide him from me forever. I will have my revenge on Vol’jin and all of da Darkspear! I have learned much by watching Bwonsamdi as he tortured my soul. Let me show you some of his style of voodoo. You think you can win? You can only delay ya destiny. You think destroyin’ my body gonna stop me from ripping you apart? Years ago, I trained Zalazane and Vol’jin to master their craft. I never would have guessed how their destinies would shake de world. I wrote a KYL recently about how the Deathlord of the Death Knights did some bad things to the Red Dragonflight. Well, they’re still unhappy about it. And they’re not shy about telling the Death Knight who did it — you, if you did the Death Knight mount quest in Legion — all about how unhappy they are. We know of your misdeeds, Death Knight. Your actions helped to save Azeroth from the Burning Legion, but our trust is damaged. We know it was you who assaulted our sanctum. We know you have corrupted and enslaved Kyranastraza. Those are offenses against Life that will be answered for, one day. That also did not go unnoticed, $n. My people are few and each life is precious. It does not excuse the offense against my flight, but we acknowledge and appreciate your… restraint. For a being such as you it could not have been easy. You are a monster in Arthas’s own image, $n. When final death comes for you, I hope you will go slowly, tortured by the pain and suffering you have inflicted on others. When all the world was engaged in greater matters, you rode across the planet dragging the dead into cursed unlife. I am sure you told yourself it was for the greater good, but mark my words, Deathlord, there will be consequences. But for now, maybe you can be useful. The greatest step one can take is the next one, $n. Keep upon this path. YOU SHOW YOUR TRUE COLORS, DEATHLORD! BEGONE FROM THIS SACRED SITE! This is something a lot of players have asked about so it’s nice to see Blizzard remembering that it happened and carrying it forward. Death Knights in Legion got up to a lot — raising the Four Horseman, raiding Undercity, attacking Light’s Hope Chapel, and of course the events related above — so there really should be some fallout from all that. I’m looking forward to it myself, when I level my DK in the expansion. There are Alliance and Horde scenarios for Teldrassil just as there were for Undercity. The Horde scenario seems concerned with cutting off all possible support for Darnassus throughout the Night Elf lands in northern Kalimdor, making it seem likely that the Kaldorei lose everything: there’s no territory in Kalimdor left to them, not even Felwood. The quest text seems to indicate killing Night Elf commanders, seizing powerful Moonstone amulets, and leading a Horde force into Darkshore from Felwood. I have just received word that Saurfang has crested the mountains between Darkshore and Felwood. Meet him at Shatterspear Vale and ensure that his passage is secure. You’re the right tool for the job, champion. Another commander. Boy was she ever in the wrong place at the wrong time. Dispatch her. We can’t risk her gathering reinforcements. Cut the rose before it can sprout thorns, I always say. Orcs make a fine soldier but they eat as much as ten dark rangers. Bring a couple of chimaeras back to camp when you return, would you? The Alliance scenario discusses the Horde defiling Moonwells to steal their power, burning down the forests as they march, destroying the Ancients, and otherwise forcing the Night Elves into a series of delaying tactics and counterattacks. 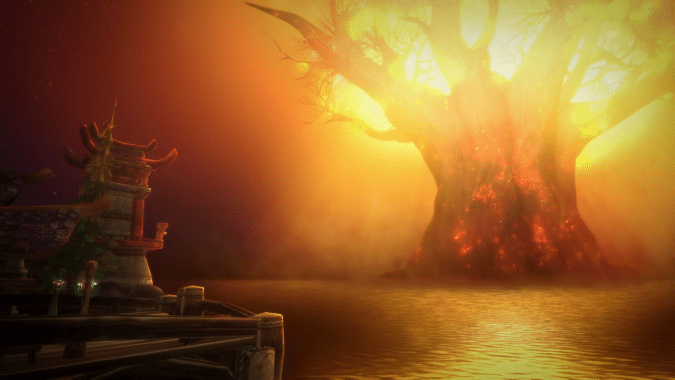 It’s clear that the Horde don’t care what they have to do to win, and that they’ll burn the forests to the ground to drive the Night Elves out. The trees of this great forest bend and break in agony as the Horde march deeper in to our lands. We must not allow them any further! The ancients have awoken in light of a new threat. Eliminate the horde presence from this place to set them back at ease. The wisps you see before you, the spirits of our Kaldorei ancestors, are but a shell of who they once were. A wisp is not a remnant of one’s consciouness, but instead the primal force of nature that binds us all in harmonious unity. Warm them with your touch, champion. They are frightened and disturbed. Give them peace. I sense a disturbance in the north. Could it be? Has the Horde begun to attack us from over the mountains? Investigate, quickly! Without actually playing the cinematic all we can say for sure is that it doesn’t look good for the Night Elves — it’s not just Teldrassil that the Horde destroys, but all of Darkshore as well, if these broadcast text lines are anything to go by. You can read all of that and a lot more over on Wowhead, if you don’t mind even more spoilers.